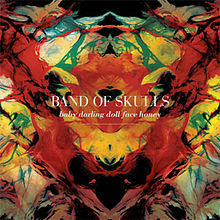 Band of Skulls – But Is It Any Good? LINEUP: Matt Hayward, Russell Marsden, Emma Richardson. WHAT’S IT ALL ABOUT: A UK trio’s debut is right in the garage rock revival wheelhouse, with simple songs, distorted guitars and some attitude. SOME WORDS, PHRASES AND CLAUSES ABOUT THIS RECORD: I waver a bit on this record. I love the guitar tone on many of the songs, and about half of these are pretty fun songs. But they seem derivative of so many bands with a male and female trading lead vocals on songs. Nothing strikes me as too original, and some of the songs are just meh – especially when they slow down. I do realize that garage rock is in of itself derivative of the wonderful scuzzy bands of the 60’s, so they’re never gonna be TOO original. Again, I do like about half to 2/3 of these songs. NOTES & MINUTAE: You know Light of the Morning – yes you do. It was the music for a Ford Mustang commercial in 2011 that was all over the TV..
IS THERE A DELUXE VERSION: There’s a bonus track version with a live cut and an acoustic cut – nothing special. GRADE: B-: I wavered a lot on this grade. The highs are pretty high and nothing is outright horrible. I’m keeping it, but it may not be played much unless I’m a neo-garage mood.